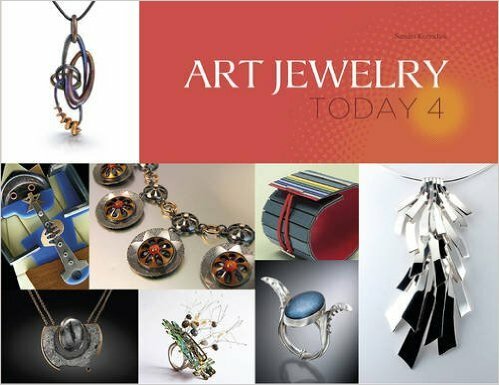 I received a stunning book from Schiffer Publishing, the fourth in a series edited by Sandra Korinchak: Art Jewelry Today 4. 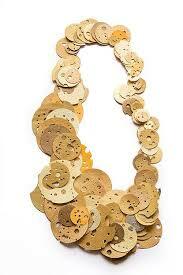 It features 400 works by 65 different artists all working in the area of personal adornment, and utilizing some surprising materials and methods along with ones that we've come to know and love already. Some of the artists give much more information about their materials, motives, and processes than others, and for that I thank them. As usual in a volume like this, a few of the works are totally unwearable, and are intended to be conceptual, but not many. Unlike some other edited books, I didn't feel that the works shown here were chosen just because they were different, but instead because they have something to add to the contemporary conversation. Ones that I particularly like, either because of interesting materials or incredible techniques, include Jacob Albee (Gibeon meteorite pieces set with gold,drusy agates, diamonds, and other gems), Patricia Alvarez ("coral" made from resin), Sabrinah Chappell (extraordinary wire wrapping with bezel-set stones), Alejandra Koreck (book pages written in braille), Susan Sanders (3D printed nylon), and Holly Stein (vintage art glass, colored cement, and sterling silver). the one made of book pages is amazing. Looks like a very interesting book. Isn't it?? I've never seen anything like it!